The insanity runs deep in Washington but it has also briefly surfaced at Simi Valley in California at the Reagan National Defense Forum, which ran through last weekend. United States Secretary of Defense James “Mad Dog” Mattis was the keynote speaker on Saturday. He had a few interesting things to say, the most remarkable of which was the assertion that Russia had again sought to interfere in the 2018 midterm elections, which were completed last month. Mattis did not address President Donald Trump’s cancellation of a meeting with Putin at the G20 summit in Buenos Aires, Argentina, a move which he reportedly supported. The cancellation was reportedly based on what has been described as an act of aggression committed by the Russian military against three Ukrainian naval vessels seeking to transit the Kerch Strait, which is since the annexation of Crimea been completely controlled by Moscow. The Ukrainians were aware of the Russian protocols for transiting through the area and chose to ignore them to create an incident, possibly as part of a plan to disrupt the Trump-Putin discussions. If that is so, they were successful. Mattis was somewhat taciturn relating to his accusation regarding Moscow’s meddling. He provided absolutely no evidence that Russia had been interfering in the latest election and there have been no suggestions from either federal or state authorities that there were any irregularities involving foreigners. There was, however, considerable concern over possible ballot and voting manipulation at state levels carried out by the major political parties themselves, suggesting that if Mattis is looking for subversion of democratic processes he might start looking a lot closer to home. The U.S. government has issued a general warning that “Americans should be aware that foreign actors — and Russia in particular — continue to try to influence public sentiment and voter perceptions through actions intended to sow discord.” Law enforcement and intelligence agencies have reportedly been working with private sector internet social networking companies, to include Twitter and Facebook, to shut down Russian and Iranian accounts in attempt to forestall any interference in either the campaigning or voting processes. Some Russians have even been indicted in absentia based on flimsy evidence but as they are in Russia they cannot be tried. One Russian student, Maria Butina, is still in jail in Virginia based on conflicting and flimsy evidence and it is not clear when she will be able to defend herself in court. 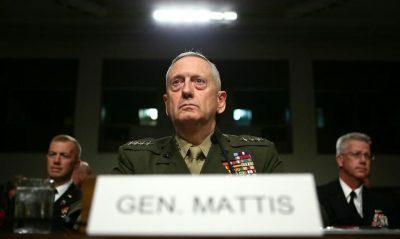 Beyond the general anti-Russia hysteria being encouraged by the media and congress, there are a number of problems with the Mattis assertion. First of all, beyond the fact that no actual evidence has been presented, it is irrational to assume that Russian intelligence services would waste their effort and burn their resources to attempt to accomplish absolutely nothing. Russia was not on the ballot last month and no candidates were running on any platform that would benefit Moscow in the slightest. To get caught “mucking around” would invite more sanctions and justify an increasingly hostile response from Washington, hardly a price that Putin would be willing to pay for little or nothing tangible. Second, the intense investigations being carried out by the Robert Mueller Special Counsel’s office have to this point developed no information suggesting that Russia did anything in 2016 beyond the low-level probing and manipulating that every major intelligence agency does routinely to get a window into what an adversary is up to. To be sure, several Team Trump associates will likely be going to jail, but their crimes so far have consisted of perjury or tax fraud. Some, like former Trump lawyer Michael Cohen are seeking desperately to find a way to implicate the president in some grander scheme, but if there is anything actually there it has yet to be identified to the public. Third, based on the evidence produced so far, the only two countries that may have cooperated with either Trump or the Deep State to influence the results of the 2016 election are Israel, which sought Trump intercession at the United Nations, and Britain, which may have engaged in a plot by the British intelligence and security services to conspire with CIA Director John Brennan to elect Hillary Clinton. So, there we go again. Another vague accusation against Russia to convince the American public that there is a powerful enemy out to get us. And lest there be any shortage of enemies Mattis also mentioned always dangerous Iran, saying “…we cannot deny the threat that Iran poses to all civilized nations.” And, by the way, Mattis in his speech strongly supported an increased “defense” budget to deal with all the threats, saying somewhat obscurely that “Fiscal solvency and strategic solvency can co-exist.” Sure. In the wonderful world of Washington, more money can fix anything.